View this sample resume for a photographer, or download the photographer resume template in Word. To be a successful candidate for the leading photographer jobs, you need to develop your resume and get yourself some decent exposure, says resume expert Kim Isaacs. Think of the effort you put into setting up the perfect shot—your resume requires the same kind of attention. 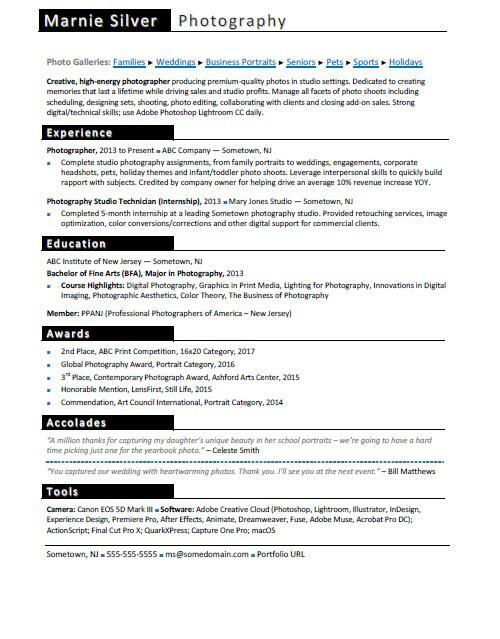 For writing tips, view this sample resume for a photographer that Isaacs created below, or download the photographer resume template in Word. According to the Bureau of Labor Statistics (BLS), you'll find the highest level of employment for this job in the following states: California, New York, Florida, Texas, and Illinois; and in the following metropolitan areas: New York City, Los Angeles, Chicago, Orlando, and Atlanta. As a photographer, you can expect to earn a median wage of $32,490 per year, or $15.62 per hour, according to the BLS. Additionally, you can learn about creative design careers and search for photographer jobs on Monster. Creative, high-energy photographer producing premium-quality photos in studio settings. Dedicated to creating memories that last a lifetime while driving sales and studio profits. Manage all facets of photo shoots including scheduling, designing sets, shooting, photo editing, collaborating with clients and closing add-on sales. Strong digital/technical skills; use Adobe Photoshop Lightroom CC daily. Complete studio photography assignments, from family portraits to weddings, engagements, corporate headshots, pets, holiday themes and infant/toddler photo shoots. Leverage interpersonal skills to quickly build rapport with subjects. Credited by company owner for helping drive an average 10% revenue increase YOY. Completed 5-month internship at a leading Sometown photography studio. Provided retouching services, image optimization, color conversions/corrections and other digital support for commercial clients. You're excellent when it comes to getting the picture, but maybe your resume still feels slightly out of focus. Could you use some help with it? Get a free resume evaluation today from the experts at Monster's Resume Writing Service. You'll get detailed feedback in two business days, including a review of your resume's appearance and content, and a prediction of a recruiter's first impression. It's a quick and easy way to ensure you're putting your most professional foot forward.